The disastrous summer transfer window: United lost more than just its legendary coach last summer; it also lost David Gill, the more-important-than-most-fans-thought conduit between Ferguson and the Glazers. If you aren’t convinced Gill’s departure has much to do with anything, or if you’re one of the many resentful supporters who considered him the Glazers’ stooge, let me put it this way: At no point during Gill’s tenure were United’s transfer plans ruined by three lawyers who may or may not have been imposters. OK, maybe that’s unfair – after all, crazy things happen, especially on deadline day. But why did Ed Woodward, Gill’s replacement, wait until the final day of the transfer window to pursue a player United clearly needed? Why did he spend twenty million pounds to sign Marouane Fellaini, a player United clearly didn’t need? And what made him think that Cesc Fabregas would leave Barcelona, the club he supposedly dreamed of playing for, to join the aging remnants of post-Cristiano United? The truth about what Ferguson left behind: In his 23 years at Old Trafford, Ferguson built three genuinely great teams: the one Eric Cantona led to a handful of Premier League titles in the ‘90s; the one anchored by the so-called “Class of ’93,” which won the treble in 1999; and the one whose fluid front three – Rooney, Ronaldo, Tevez – secured Ferguson’s second Champions League title in 2008. By contrast, the team Ferguson bequeathed to Moyes was arguably his worst, a lackluster assortment of injury-prone veterans and jaded stars, with comic relief supplied by an inept left-back claiming to be Patrice Evra. (United’s title win last season was both a testament to Ferguson’s managerial acumen and evidence of how far the Premier League had declined.) Just three seasons after appearing in the Champions League final, United can no long beat teams like Fulham, and the reasons – a weak central midfield, a shoddy defense, a diminished strike force – are all results of Ferguson’s mistakes: the sale of Paul Pogba, the club’s failure to invest Ronaldo’s 80-million pound fee in the transfer market, the gradual alienation of Wayne Rooney. Woodward and Moyes have botched the most important transition in United’s history, but, to be fair, Ferguson didn’t leave them much to work with. 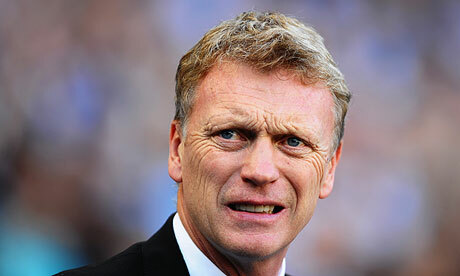 David Moyes said that they will not give up the title this year, well let’s see.